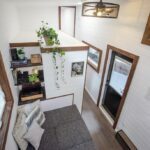 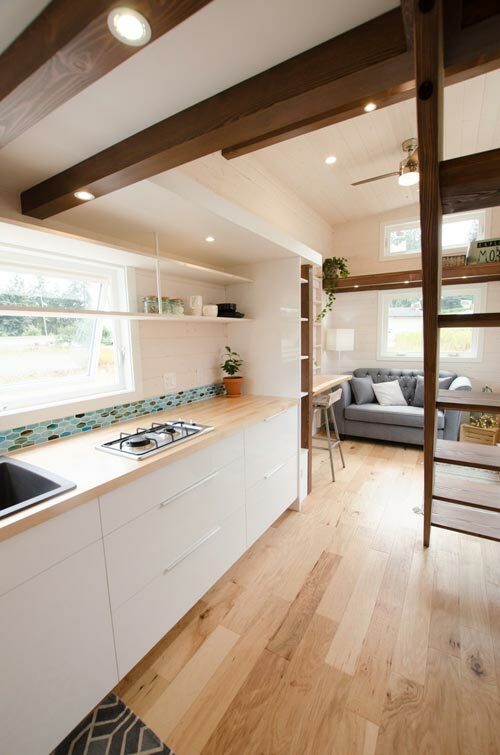 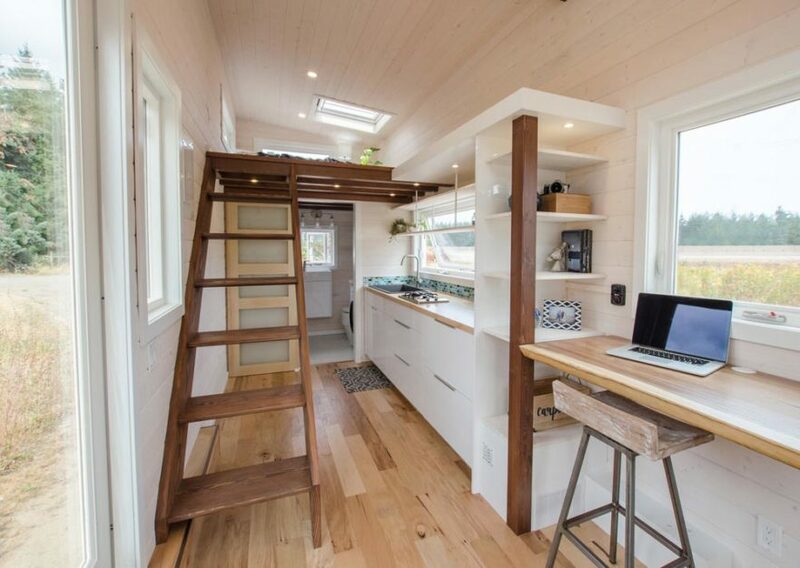 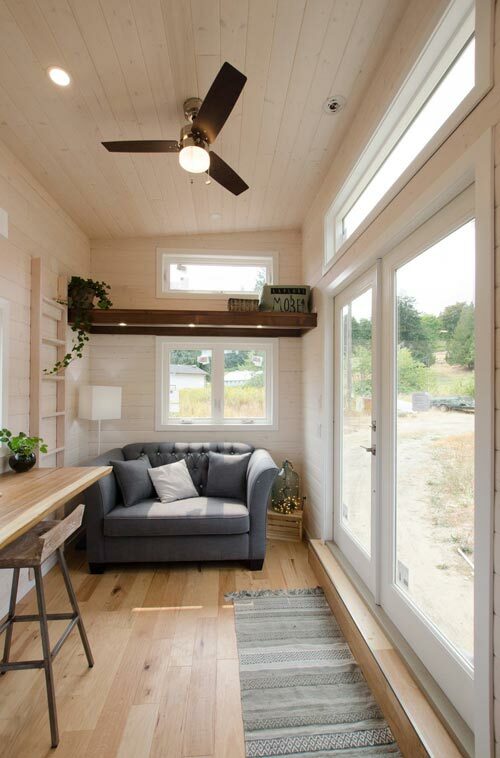 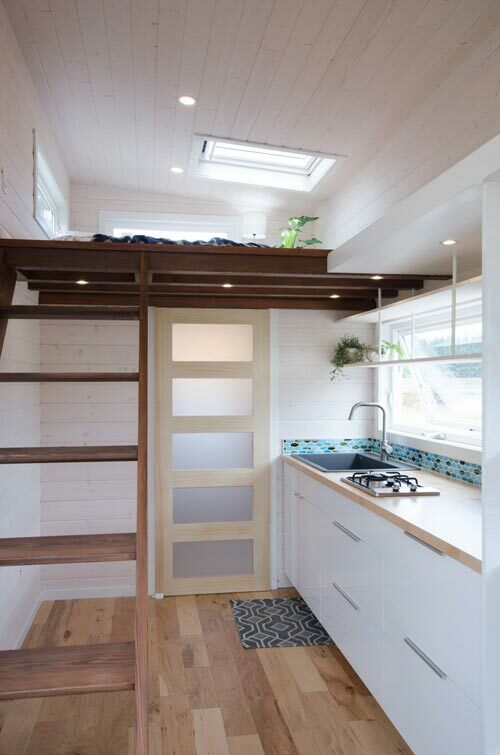 From Vancouver Island-based Rewild Homes is the Stellar Jay, a Scandinavian style tiny home with a bright, minimalist interior. 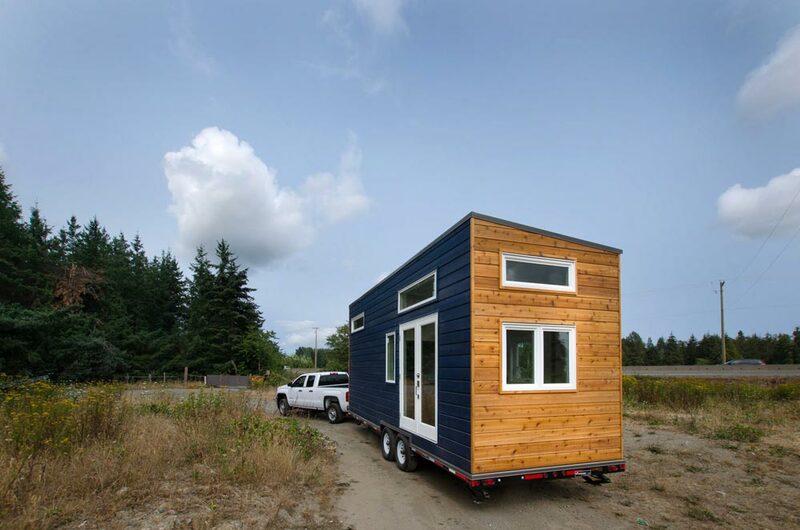 The exterior has two-tone siding, full-light garden doors, and awning style windows with white trim. 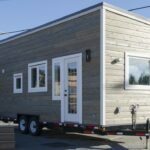 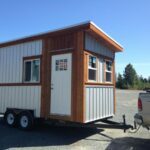 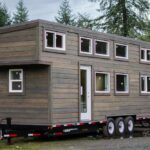 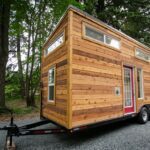 The tiny home sits on a double axle trailer and has a single slope metal roof. 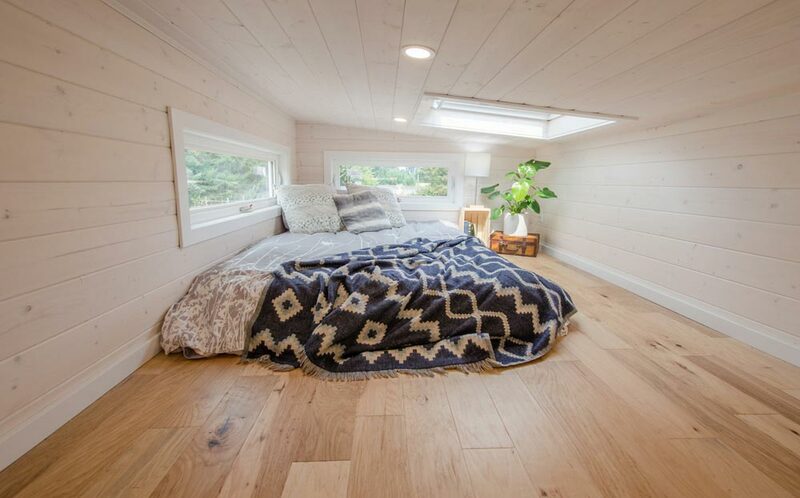 Inside the Stellar Jay are white-washed walls and light wood flooring. 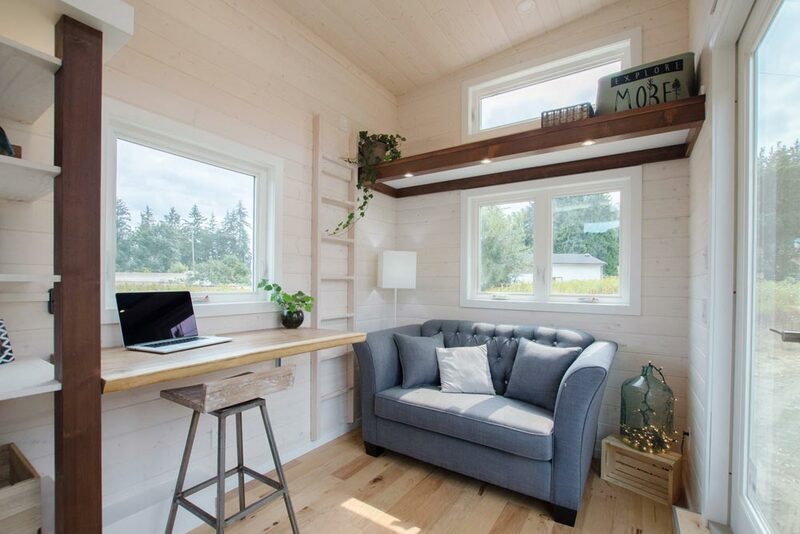 A live-edge drop leaf desk sits in front of a large window. 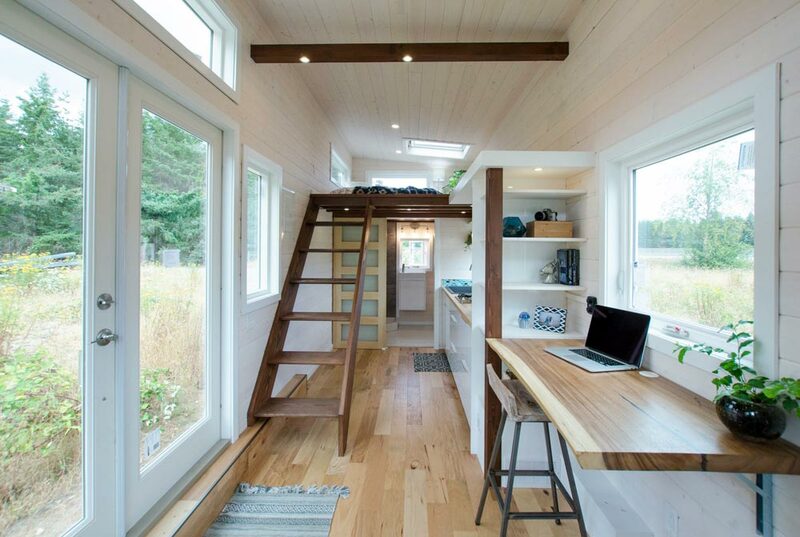 Next to the desk is a built-in bookshelf with a forced air propane heater under the bottom shelf. 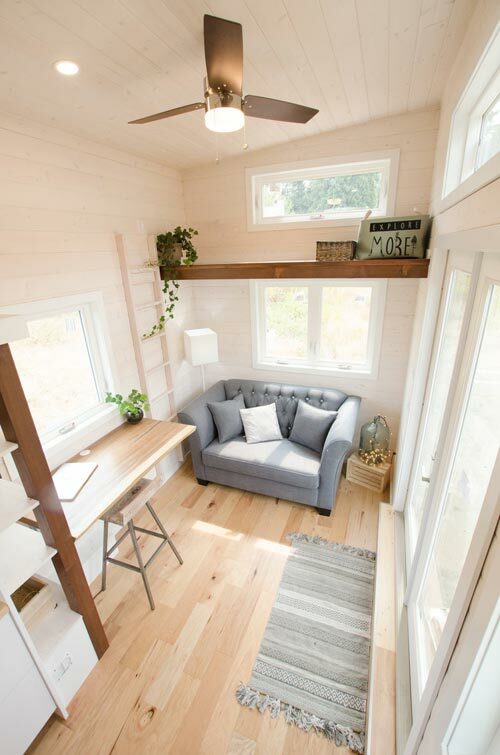 Along with the desk, the main living area has a couch, storage loft with ladder access, and a ceiling fan. 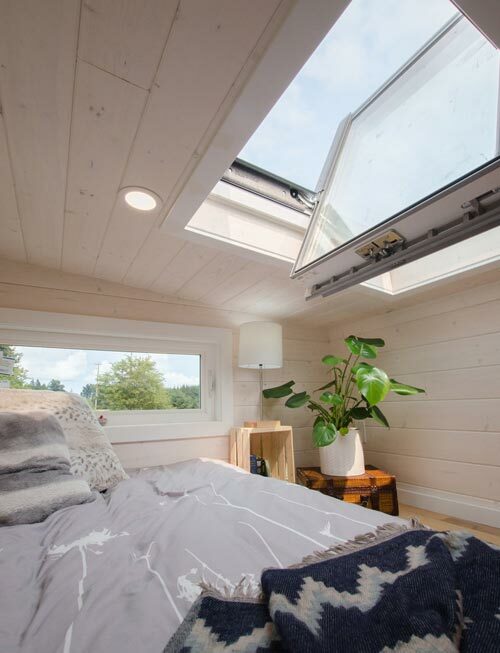 The master bedroom loft provides unobstructed views of the stars from its fully-opening skylight. 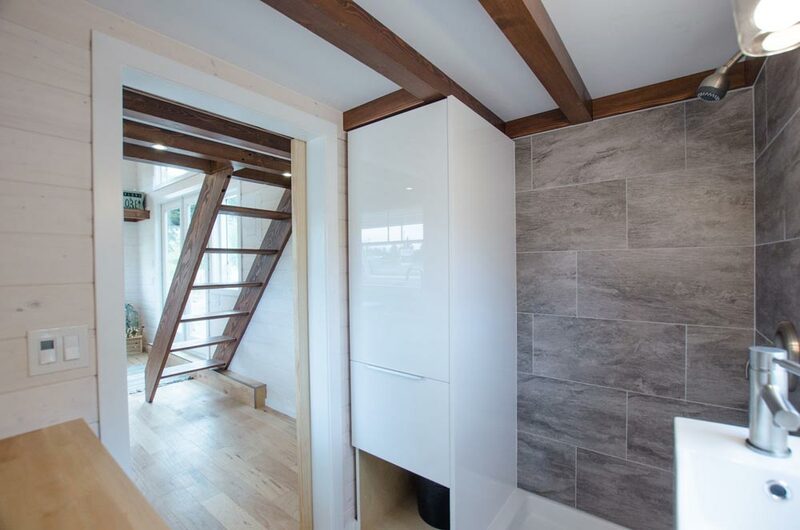 The loft is accessed by semi-floating stairs, which are easier to use than a ladder while keeping the downstairs open. 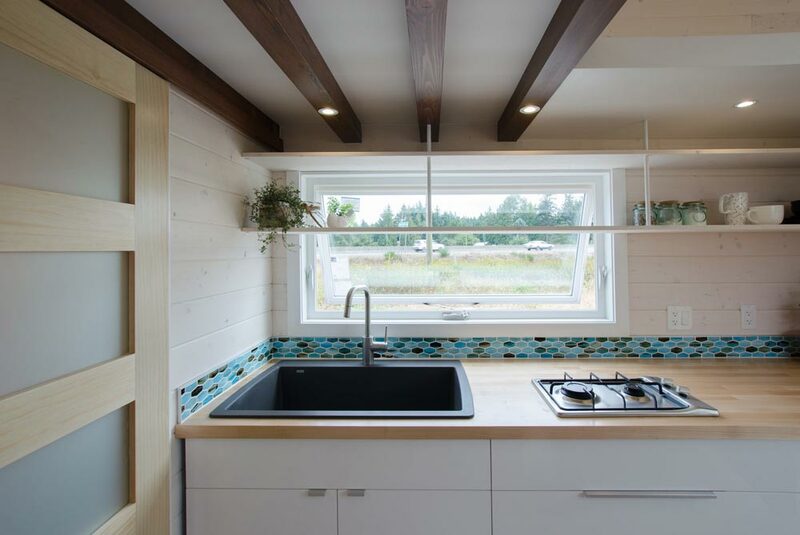 The kitchen features white cabinets and a splash of color with its blue and green tile backsplash. 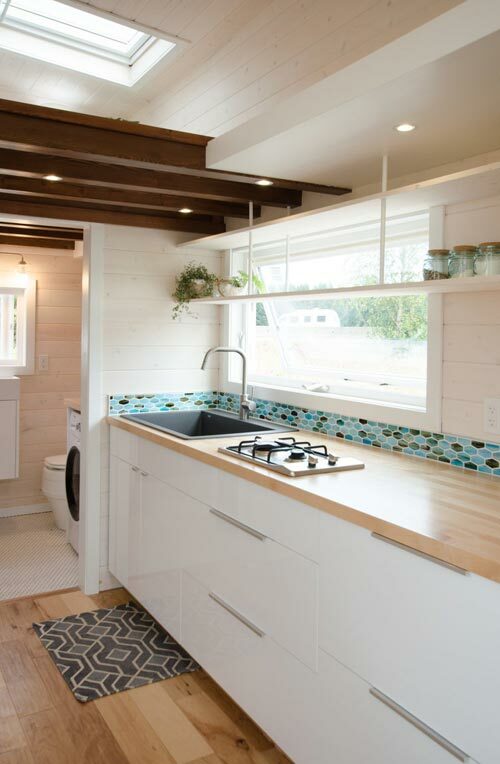 There is a two burner gas cooktop and a large single bowl kitchen sink with gooseneck faucet. 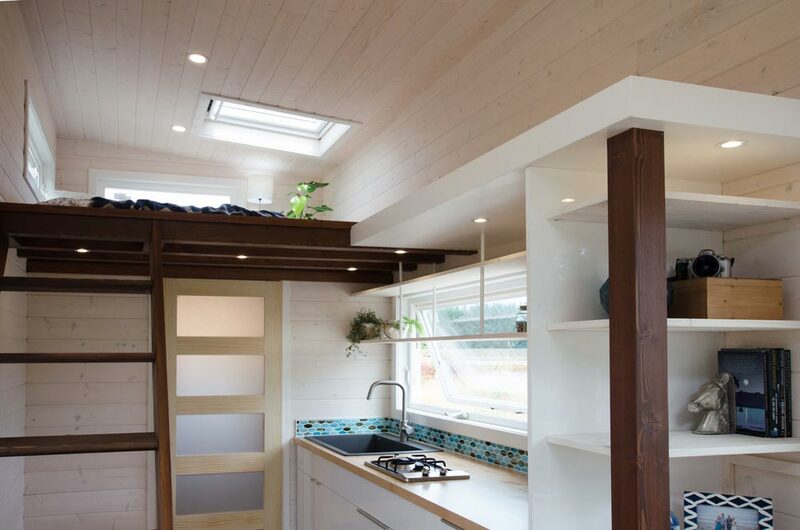 Upper shelving spans the length of the kitchen and passes in front of the window so the owner can have a window garden. 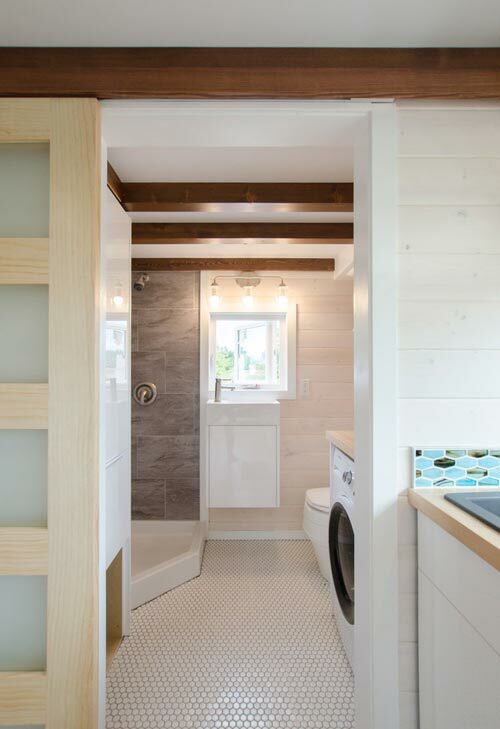 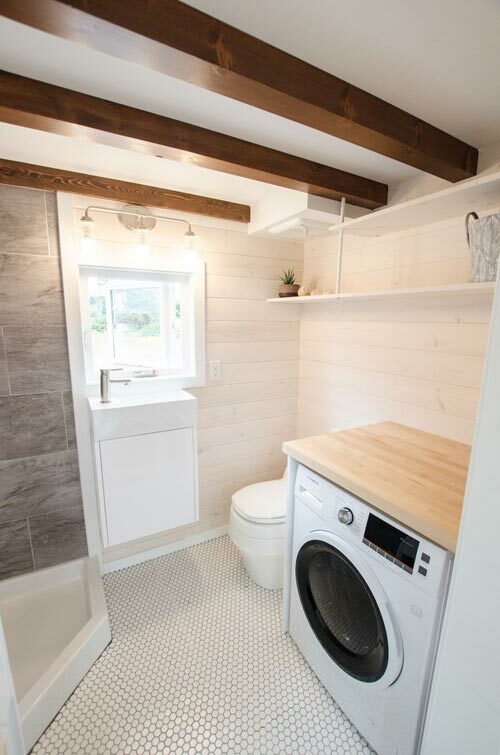 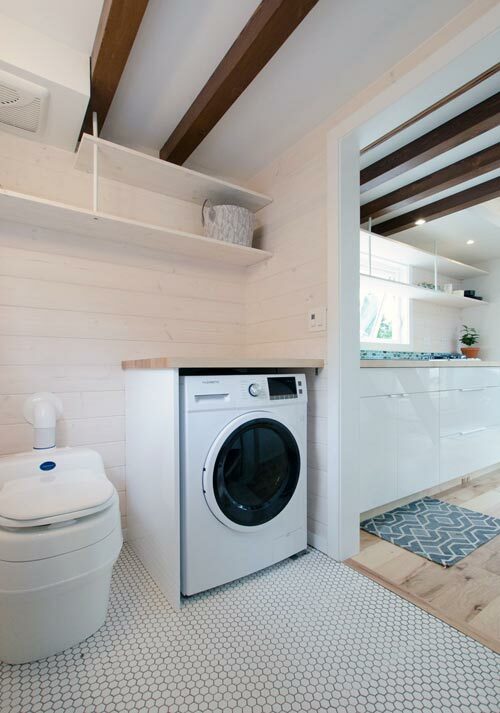 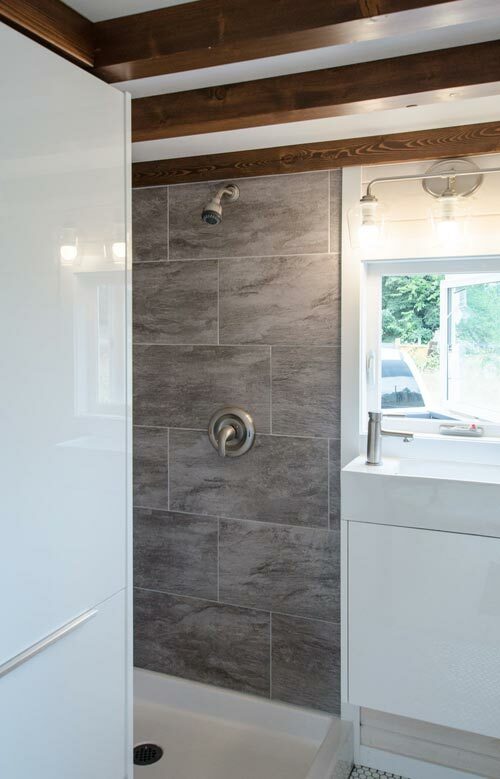 The bathroom includes a floor-to-ceiling closet, wall-mounted modern sink, composting toilet, washer/dryer combo, and corner shower. 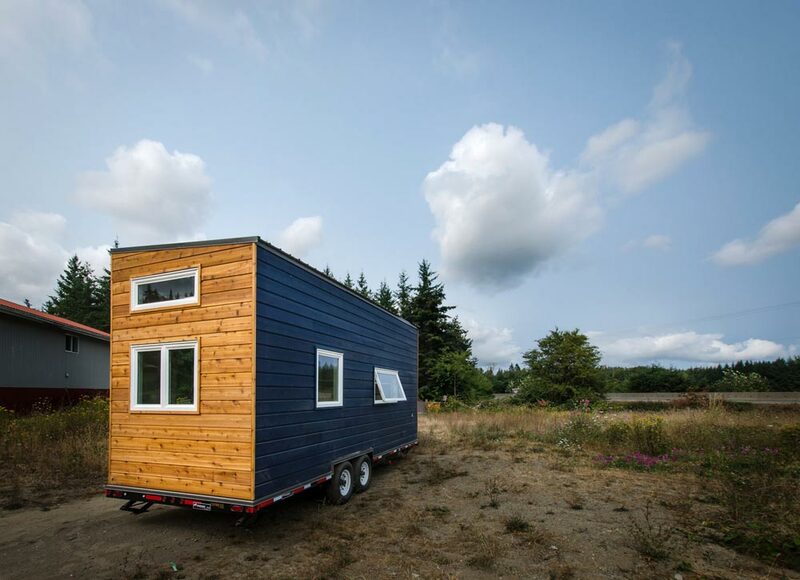 For more information about the Stellar Jay, please contact Rewild Homes. 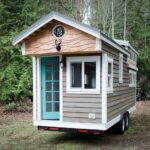 Also available from Rewild Homes: Starling, Stellar Jay, Albatross, Warbler, Kestrel, Ptarmigan, Blue Heron, Fox Sparrow, Whiskey Jack, Rewild Tiny House on Wheels.